I have a theory that Steam Punk is soon going to become much bigger. For those of you who don’t know the term, Steam Punk is the general name (coined in 1987 by the Sci Fi author K.W. Jeter, as I learned from my friend Cynthia) for a movement in fashion and fantasy that has been going on for the last forty-odd years, which mixes 19th century (ie: steam-era) sensibilities with raging technophilia. Think Jules Verne’s Captain Nemo in his Nautilus, add some steam powered laser cannons, and you’ve got the right mindset. The word “punk” is not being used here in its sense of disaffected youth play-acting at working class rage, but rather in the sense of hacking a culture through the reappropriation of resonant imagery – in this case Victorian era imagery. There are many examples of Steam Punk in popular culture, far more than I could list in this post (HERE is a fairly comprehensive list), from “Those Magnificent Men in their Flying Machines” in 1965 to the haunted old inventions in “Warehouse 13” and the spy-tech of the forthcoming “Sherlock Holmes” film, with many touchstones along the way. For example, Miyazaki films are just loaded with Steam Punk ideas. Yet it seems that translating Steam Punk to the big screen is fraught with peril. The Alan Moore graphic novel “The League of Extraordinary Gentlemen” and the iconic 1966 TV show “The Wild Wild West” were both great examples of Steam Punk. Yet each was made into a horrifyingly atrocious film. The reason is obvious. In both cases, the originals integrated their fantasy versions of Victorian era technology into a story that genuinely respected its characters. Whereas the film versions both became so caught up in their cool visuals and gadgets that they ignored such niceties as character, depth, motivation, relationships. The results were pretty much unwatchable. But the reason I think Steam Punk is going to be big is due to a combination of two things: (1) our nation has just suffered its biggest financial collapse in sixty years, and (2) this collapse has done nothing to abate our culture’s insatiable lust for ever cooler and shinier technology. In times of hardship, as jobs become scarce, and as people find it progressively more difficult to get by, a culture turns to symbols of elegance, of glamour, to reduce its anxiety and stave off a sense of failure and even panic. This does not happen in times of wealth. For example, in the 1960’s, when the U.S. was experiencing a period of heady economic growth, an entire generation expressed its sense of freedom and empowerment by dressing in rags. Jeans and tee-shirts became symbols of power, symbols which had true potency only because they were “post-economic” – the young people who wore these things generally came from well-off families, and were in rebellion against “conformist” parents possessed of high paying jobs and middle class homes. But in the Great Depression, people did not glamorize the lost men, the hoboes. That glamorization came later, during a time of post-War abundance. Rather, young people were enraptured by the glamor of Fred and Ginger. Astaire and Rogers were the epitome of elegance. A well turned out top hat, cane and tails, the sweep of a sleeveless evening gown, these were the true symbols of longed-for empowerment in a time of great hardship. My theory is that Steam Punk is coming around because it will allow an expression of glamour, safely removed from any association with our recent failed cult of modern capitalist excess. Technology and its possibilities can be shown in a context of elegance, in a way that is safe because it is quaint. This is all catnip to a nation that craves its technology fix but is still reeling from economic failure. I don’t come from this abtractly. I have specific images in mind that I think will resonate with people now. 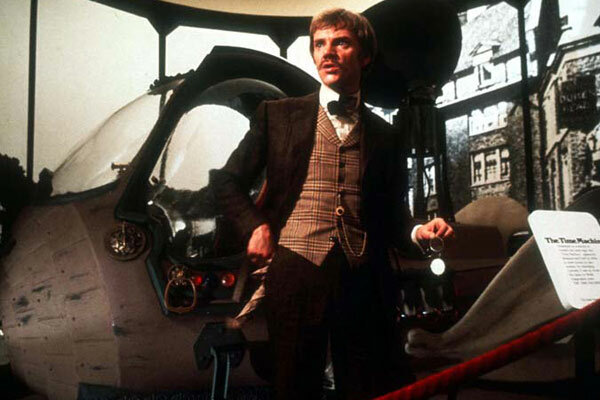 One of these is the sight of Malcolm MacDowell as the time travelling H. G. Wells in Nicholas Meyer’s 1979 film “Time after Time”, dressed elegantly in three piece tweed, glancing at his pocket watch just before putting his time machine into gear. I just have an intuition that in such uncertain times as these, people looking to escape their woes through fantasy will be drawn to the elegance of such visions. Our nation’s economy may be out of steam, but the sheer exhuberant elegant playfulness of Steam Punk might still provide a way for our wounded nation to tap into its innate spirit of optimism. This entry was posted on Sunday, September 27th, 2009 at 11:59 pm	and is filed under Uncategorized. You can follow any responses to this entry through the RSS 2.0 feed. You can leave a response, or trackback from your own site. Do you see any parallel or connection between “steam punk” and the Depreesion era WPA murals by Diego Revera? Were they possibly SP before it had a name? Interesting. Explain the connection to me. I think of Diego Revera’s depression era murals as being highly political statements for workers’ rights – not retreats into fantasy (the way the Astaire/Rogers films were). But I could be missing something. Perhaps I am wrong by 180 degrees. I am not sure. The genre of murals I was considering, Diego Rivera coming first to mind but actually there were many others of the time, were doing a style I have found was called “socialist realism”. It was popular in the mid to late 1930’s, and had a heavy soviet influence. A lot of the WPA artists used this style. Some examples, in sculptural form, are the Atlas in front of 30 Rock and figures in the Bank of Canada by Jacobine Jones. I realize I have changed the original parameters of my question by going beyond Diego Rivera’s work into the whole genre, but the style was what I meant to refer to. I had no idea before looking into this of the volume of artists all doing the same style, often for the WPA. The particular image I was considering featured a heroic, square jawed worker, in motion, with an outsized wrench in his hand and huge cogs and machinery in the background. Typical of the genre is the happy, purposeful, fearless heroic caucasian male worker (Rivera’s murals may differ on these particulars), glorified with some outsized means of production behind or surrounding him. It was the juxtaposition of this relaxed, heroic figure with exaggerated machinery that created the association to what you were discussing in “Out of Steam”, much like Malcolm MacDowall in front of his time machine. But as I think about it, in the murals the machinery was glorified and made to look powerful, as well as the worker; and as I understand it, SP is about antiquating, ornamenting, basically rendering less threatening the machinery part of the equation. I believe the intent of much of the commissioned WPA/ socialist realism art was to reassure a shell shocked public, and to help rebuild trust in the industrial machine which had broken down. The message is in the relationship between the hero and the machinery. The similarity to your SP discussion is that in a traumatic time, a relationship between man and machine is expressed in imagery with a psychological component of reassurance. A difference might be that in the case of SP the reassurance comes from the machinery being de-emphasized through antique-ing. But in the WPA imagery, reassurance stems from the exaggerated power of and, in the context of time, rebuilding of the machinery. I hope I have been able to make some kind of connection between SP and socialist realism, if not Diego Rivera exactly. Two asides: first, I think part of the psychology of SP is that it often involves feats that were really technologically unfathomable during the real era of steam. A perfect venue for it would be a movie about Tesla. And second, I am willing to bet that many WPA artists later found their footing in comic book/ cartooning world, where the realism style has perpetuated…. and that I might be related to one of these artists, or at least one of their proteges. Ben, that’s a very interesting analysis! I suspect that the large difference in tone between socialist realism and steam-punk may come down to the fact that the former is glorifying a role in society, whereas the latter is glorifying a kind of countercultural rebellion against society’s norms, like the surrealists and the beats in their time. Definitely something interesting to think about.